I have setup per these instructions for Data Matrix,(https://www.idautomation.com/barcode-fonts/universal/excel-2d-qrcode-datamatrix-pdf417-font.html) but I keep getting a #Value! error in my excel cell. 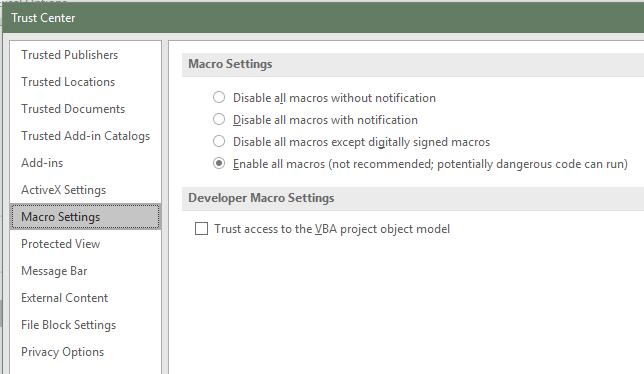 Access the Trust Settings and Allow Macros for VBA and Barcode Fonts. NOTE: Review company policy and consult your Administrator before enabling Macros to run. 2. Right-click File and select Customize Quick Access Toolbar. 4. 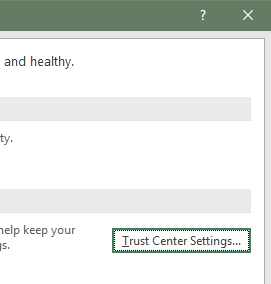 Select Trust Center Settings. 6. Select OK and OK.